Want to discover the wonders of Positano? Besides the fabulous sea of the Amalfi Coast, you will find a village where you can explore on foot, in relax, incomparable places and many opportunities for pleasure between events, natural beauty and food. 1. The Saracen Towers: a journey through time. Do you love art and history? Between the monuments to visit in Positano, stand out several watchtowers that were built in medieval times, to spot incoming ships. Their purpose was to prevent the arrival of the pirates from the sea and, in general, any kind of invasion – especially the Saracen, who was raging in the Mediterranean coast in that time. Among the most famous, discover the Tower of the Sponda, that until the mid-eighteenth century, oversaw Positano from the highest part of the Marina Grande; or the Tower Trasita, near the beach of Fornillo, where there is the homonym Tower Fornillo. Finally, visit the Angevin Tower on island Li Galli, that in time became a residence for many celebrities. Visit these towers is like reliving the history of Positano, plunge into a charming past. Spiaggia Grande, Bagni d’Arienzo, Fornillo, Laurito … the places where to sea life and the beach in Positano are a set of relax and fun lifestyle – beautiful beaches embedded in the scenery of the Amalfi Coast, with an international touch and glamour. For any requirement of confidentiality or liveliness, the beaches of Positano are different, in their common spectacular landscapes. You can choose the small and wild beach of Laurito, reached by a flight of stairs: you will enjoy a quiet and informal atmosphere. Do you love beautiful places, chosen by celebrities? The beach of Arienzo is waiting for you: after the 300 steps that are used to reach it, the staircase leads you to the beach where the sun sets later, near fabulous villas of the international jet-set. The main beach of Positano is to Marina Grande, lively and frequented by tourists and VIP every day and every night, thanks to the many restaurants, club and disco! You can choose the Fornillo Beach if you’re looking for a relaxing and peaceful location – especially during the week. The most obvious suggestion is to visit Positano in the most beautiful seasons, spring and summer; but we invite you to discover, however, the beauty of this village also in the fall or winter. The charm of the alleys and the structure of Positano, the whole vertical, make it a little jewel, with a unique and unrepeatable atmosphere. Among the significant monuments to visit, see the Church of Santa Maria Assunta, dating back to the X century and which stands out for its majolica dome, the Byzantine icon of the Black Madonna and sculptures by contemporary artist Mimmo Paladino. You’ll find also archaeological evidence with the Roman Villa, which is located right below the main square. For a relaxing stroll along Positano, cross street Fornillo, the most scenic and narrow road, full of bars with terraces. You will come to the bay for a dip in the sea, or looking for a restaurant where you can taste typical dishes of Positano, seafood recipes as pezzogne all’acqua pazza (fish in “crazy water”), the peppered mussels or the bavette pasta with crab! The narrow streets of Positano create a fascinating journey, a maze that winds in height, where to find the vitality of many shops, a continual coming and going between the center of the village and the many ramifications, to the beach. There are many opportunities for shopping, and it is no coincidence that there are so many boutiques and tailors in Positano: handmade sandals, Capri style clothes, swimsuits decorated, unique wedding dresses. Fashion is always home, with the original creations of many designers and local clothing brands, visible even in the early summer fashion shows that are organized in Positano. You may also choose to buy typical food, local crafts or in the stores of luxury brands and in art galleries. In any case, Positano you reserve a time of relaxation for your shopping, exclusive and unique. 5. The caves, breathtaking views. Glimpses of the beauty of Positano reach its maximum shine in the caves, le Grotte, typical formations in Amalfi Coast provide an experience unique in landscaping. The village is not far from the Emerald Grotta, to Grotta Fornillo and Grotta La Porta. The rocky coast of Positano offers various possibilities to visit these ancient caves, which still bear witness to the human presence in this territory, populated already during the Mesolithic. In addition you can also visit unique places such as Fiordo di Furore, near Positano: a rock formation carved out over the centuries by the river Schiato. 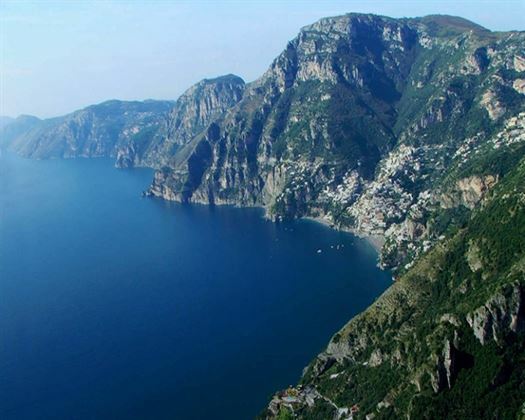 Coming down from the mountain to the sea, the river has created a spectacular fjord, UNESCO heritage, already immortalized by Rossellini and still attracts many divers, who dare to jump from 30 meters into the sea of Positano! For those who enjoy hiking and trekking, Positano offers, in the neighborhood, the paths that allow walks up the slopes of Mount Pertuso, in the hamlet of Nocelle. In a path that has been dubbed The Path of the Gods (Sentiero degli Dei), the beauty of which there is a scenario all along the Amalfi Coast. A unique place, where walking is slightly downhill, starting from the highest point of Nocelle, both uphill. In the first case the view will be magnificent, for about 3 hours of walking and for almost 8 km you will enjoy the beauty of the Amalfi Coast. On the way you will meet a wonderful Mediterranean vegetation, made of bushes, heather, oaks, rosemary and strawberry. Here several sheep and goats are grazing conducted, in this territory of still intact and ancient beauty. 7. The Falconry, emotions and nature. Just near Positano, a group of enthusiasts decided to recover the ancient art of falconry, to bring the public closer to the natural world, the fly elegant and majestic birds falconers – natural predators of which you can admire the aerial tricks before a breathtaking landscape! Mountains, the sea, the flight of the falcons … missed a frame that can be a different idea to live in this land full of natural beauty, which already at the time of emperor Frederick II was a place of hunting with falcons and raptors. Are available in the territory of Nocelle-Positano, flight demonstrations, days dedicated to falconry and treks with prey and falconers!